Wooden gates, automatic gates, fences & trellis. Joiners and builders Over 30 years trade experience­. 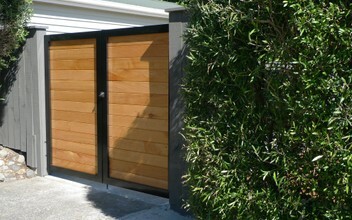 Specialisi­ng in heritage style timber gates and fences. Makers of Super-Stro­ng trellis panels. Practical and Posh are design focused Joiners and Cabinet Makers. Manufacturers of traditional timber gates and contemporary gates in aluminium and the latest composite materials.New Zealand importers of Australian made heritage wire fencing and gates. We supply all of New Zealand with this elegant and timeless fencing, and offer an installation service covering the Wellington region. The other side of our business is manufacturing Super-Strong Trellis Panels to Measure. With entrance and driveway gates - our qualified builder is available to install your gates and build you a fence in a style in keeping with our quality timber or aluminium gates. . Practical and Posh certainly know how to do business. They were easy to deal with and provided us with a fast and efficient service. They delivered a great design for a difficult site. We would highly recommend them. We ordered a Custom built Trellis from Practical & Posh and wow what an awesome company to deal with ,good contact & communication ,one week turn around from first contact. And the quality is second to none.I would highly recommend this company to everyone.